غفرانی, محمد, معنوی, غلامحسین, میرشکرائی, سید احمد. (1393). بررسی مقاومت به چسبندگی رنگ‌های شفاف رایج در صنایع مبلمان بر روی گونه‌های چوبی راش، ملج، توسکا و نوئل. مجله صنایع چوب و کاغذ ایران, 5(1), 33-44. محمد غفرانی; غلامحسین معنوی; سید احمد میرشکرائی. "بررسی مقاومت به چسبندگی رنگ‌های شفاف رایج در صنایع مبلمان بر روی گونه‌های چوبی راش، ملج، توسکا و نوئل". مجله صنایع چوب و کاغذ ایران, 5, 1, 1393, 33-44. غفرانی, محمد, معنوی, غلامحسین, میرشکرائی, سید احمد. (1393). 'بررسی مقاومت به چسبندگی رنگ‌های شفاف رایج در صنایع مبلمان بر روی گونه‌های چوبی راش، ملج، توسکا و نوئل', مجله صنایع چوب و کاغذ ایران, 5(1), pp. 33-44. غفرانی, محمد, معنوی, غلامحسین, میرشکرائی, سید احمد. بررسی مقاومت به چسبندگی رنگ‌های شفاف رایج در صنایع مبلمان بر روی گونه‌های چوبی راش، ملج، توسکا و نوئل. مجله صنایع چوب و کاغذ ایران, 1393; 5(1): 33-44. در این تحقیق، مقاومت به چسبندگی (آزمون خراش- نوارچسب Cross-Cut) رنگ‌های شفاف سیلر- کیلر و سیلر- نیم پلی‌استر، و با توجه به درصدرطوبت، در گونه‌های چوبی‌راش (Fagus orientalis)، ملج (Ulmus smontana)، توسکا (Alnus glutinosa) و نوئل (Picea glauca) مورد مطالعه قرارگرفت. تخته‌هایی به ابعاد 12×110×550 میلی‌متر از قسمت برون چوب و از تخته مماسی تهیه شدند و به مدت یک ماه با رعایت اصول روش‌های چوب خشک کنی در هوای آزاد قرار گرفتند. سپس برای متعادل‌سازی رطوبت، به طور مجزا برای رسیدن به رطوبت 8، 12 و 15% در سه اتاق کلیما قرار داده شدند. تمامی سطوح نمونه‌ها با استفاده از پیستوله رنگ‌کاری شدند و آزمون‌های‌ مقاومت به خراش بر روی آن‌ها انجام شد. نتایج نشان داد که بیشترین مقدار مقاومت به خراش، با درصد از دست دادن چسبندگی 4/10%، مربوط به رنگ سیلر- نیم پلی‌استر استفاده شده بر روی گونه‌ی چوبی ملج با رطوبت 8% و کمترین مقدار مقاومت به خراش با درصد از دست دادن چسبندگی 6/53%، مربوط به رنگ سیلر- کیلر استفاده شده بر روی گونه‌ی چوبی نوئل با رطوبت 15% بوده‌است. Keshani, S. 2006. The comparison of polyester, acid catalyzed lacquers and nitrocellulose lacquers effect on ”Fagus orientalis” wood and plywood furniture, MSc. 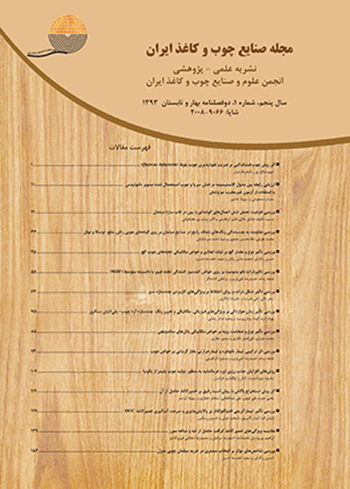 Thesis, Faculty of Natural Resources, University of Tehran, 231p (In Persian). Gholamiyan, H. 2010. Improvement of water and weathering resistance of wood using nanozycosil, nanozycofil and clear coatings, MSc. Thesis, Faculty of Natural Resources, University of Tehran, 82p (In Persian). Higley, T.L. and Kink, T.K., 1990. Biological degradation of wood. Phytopathology 69(1): 1151–1158. Chin, J., Byrd, E., Martin, J. and Nguyen, T., 2005. Validation of the Reciprocity Law for Coating Photo degradation, Journal of Coating Technology and Research 2(7): 499–508. Eldwson, T., Bergstrom, P. and Hamalainen, M., 2003. Moisture dynamics in Norway spruce and scots pin during outdoor exposure in relation to different surface Hutments and handling condition Holzforschung 57: 219-227. Faucheu, J., Wood, K.A., Sung, L.P. and Martin J.W., 2006. Relating gloss loss to topographical features of a PVDF coating. Journal of Coatings Technology and Research 3: 29-39. Kollmann, F.P. and Côté, W.F., 1984. Solid Wood, Principles of Wood Science and Technology, Reprint Springer-Verlag, Tokyo. 180p. Berkel, A., 1972. Wood Material Technology. Istanbul University Faculty of Forestry Publications, Istanbul, Publication Number. 1:745. Ozdemir, T., 2003. The Investigations of varnishes’ features at some tree species grown in Turkey. Ph.D. Thesis. K.T.U. Institute of Science and Technology, Trabzon, Turkey, 314p. Feng, S.X., Dvorchak, M., Hudson, K.E., Renk, C., Morgan, T., Stanislawczyk, V., Shuster, F., Todd, D., Bender, H. and Papenfus, J., 1999. New high performance two component wood coatings comprised of a hydroxy functional acrylic emulsion and a water-dispersible polyisocyanate. Journal of Coatings Technology and Research 71(12): 51–57. Ginkel, M.V., 2001. New development in water based polymers for industrial wood coatings. Surface Coatings International 2: 3–8. Nemli, G. and Usta, M., 2004. Influences of some manufacturing factors on the important quality properties of melamine impregnated papers. Building and Environment 39(5): 567–570. Zavarin, E., 1984. Activation of wood surface and non-conventional bonding, In: R. Rowell (Ed. ), The Chemistry of Solid Wood, ACS,Washington. Sonmez, A. and Budakci, M., 2004. Protective Layers and Paint/Varnish Systems, Finishing on Woodworking II, Gazi University Technical Education Faculty, Ankara. Sonmez, A., 1989. Durability of Varnishes Used on Surfaces of Wood Furniture Against Important Physical, Mechanical, and Chemical Effects, Ph.D. Thesis, Department of Furniture and Decoration, Gazi University, Ankara. Rijckaert, V., Stevens, M. and Acker, J.V., 2001. Effect of some formulation parameters on the penetration and adhesion of water-borne primers into wood, Holz als Roh-und Werkstoff. 59: 344-350. Sonmez, A., 2009. Effect of wood moisture content on adhesion of varnish Coatings, Gazi University, Ankara. Scientific Research and Essay 4 (12): 432-437. Keskin, H., 2010. Scratch resistance of cellulosic, synthetic, polyurethane, waterborne, and acid-hardening varnishes used on woods. Gazi University, Ankara, Turkey. Industrial Crops and Products 31(10): 219–224. Kaygin, B. and Akgun, E., 2008. Comparison of conventional varnishes with nanolacke UVVarnish with respect to hardness and adhesion durability. International Journal of Molecular Sciences 9: 476-485. Ozdemir, T. and Hiziroglu, S., 2007. Evaluation of surface quality and adhesion strength of treated solid wood. Journal of Materials Processing Technology 186: 311-314. Annual Book of ASTM Standard, D 3359, 1997. Standard Test Methods for Measuring Adhesion by Tape Test. Annual Book of ASTM Standard, D 3924, 1996. Standard Specification for Standard Environment in Conditioning and Testing Stain Varnish, Lacquer and Related Materials.